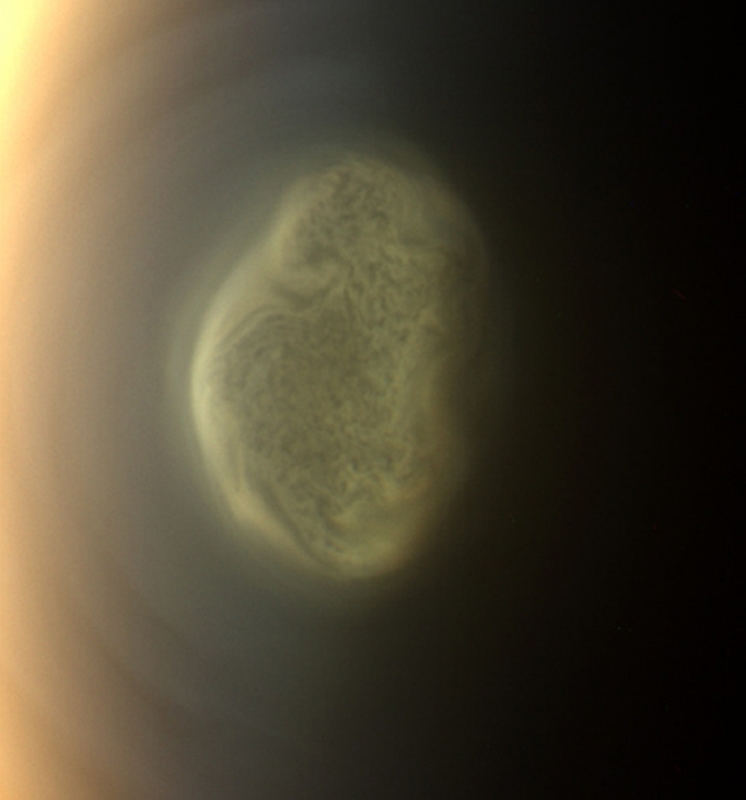 Titan’s south polar vortex. Image Credit: NASA/JPL-Caltech/Space Science Institute. October 20, 2016 – As Titan approaches its northern summer solstice, NASA’s Cassini spacecraft has revealed dramatic seasonal changes in the atmospheric temperature and composition of Saturn’s largest moon. Winter is taking a grip on the southern hemisphere and a strong vortex, enriched in trace gases, has developed in the upper atmosphere over the south pole. These observations show a polar reversal in Titan’s atmosphere since Cassini arrived at Saturn in 2004, when similar features were seen in the northern hemisphere. Heat is circulated through Titan’s atmosphere via a pole-to-pole cycle of warm gases upwelling at the summer pole and cold gases subsiding at the winter pole. Cassini’s observations have shown a large-scale reversal of this system immediately after the equinox in 2009. Titan’s hemispheres have responded in different ways to these seasonal changes. The wintery effects have led to a temperature drop of 40 degrees Celsius in the southern polar stratosphere over the last four years. This contrasts with a much more gradual warming in the northern hemisphere, where temperatures remained stable during the early spring and have shown a 6-degree increase only since 2014. Within months following the equinox, the vortex in the stratosphere over the south pole had become prominent, as had an atmospheric ‘hot spot’ at high altitudes. The corresponding features in the northern hemisphere had almost disappeared by 2011. Inside the polar vortex over the increasingly shadowed south pole, there has been a rapid build-up of trace gases that accumulate in the absence of ultraviolet sunlight. These include complex hydrocarbons and nitriles such as methylacetylene and benzene, previously seen only at high northern latitudes. In the northern hemisphere, the trace gases have persisted well into summer. These are predicted to undergo a slow photochemical destruction, with species disappearing at different rates depending on their chemical lifetimes. However, since early 2016, a zone of depleted molecular gas and aerosols has developed across the entire northern hemisphere between an altitude of 400 and 500 kilometers, suggesting a complex dynamical effect starting at high altitudes in the atmosphere.